The Chicago Bears made the biggest news of this NFL offseason by acquiring the franchise quarterback this team has been looking for since, oh, Sid Luckman in the 1940s (sorry, Jim McMahon, you didn’t last long enough). 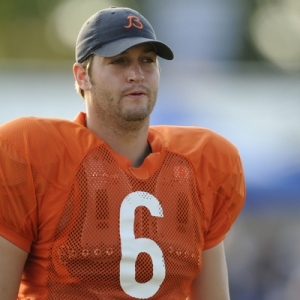 Of course I’m speaking of the trade with Denver for Pro Bowler Jay Cutler. Chicago gave up a lot, including two first-round picks and last year’s starting QB, Kyle Orton, but most experts think it’s worth it to get a 26-year-old who threw for 4,526 yards and 25 touchdowns last year. The naysayers would say that Cutler was just 17-20 as a starter in Denver and that he has thrown 37 interceptions in his two seasons. Certainly the picks need to come down, but Cutler also had a lousy defense in Denver – the QB was 13-1 as a starter when the Broncos held opponents to 21 points or fewer. The Bears now can claim the best quarterback in the NFC Central – when was the last time that could be said? However, Cutler doesn’t have anywhere near the group of receivers in Chicago that he had in the Mile High City. Devin Hester is still trying to make the transition to full-time receiver (he will return just punts this year), and he’s the top guy. Rashied Davis probably lines up at No. 2 again, and that’s not great. However, the Bears are counting on 2008 NFL Draft third-round pick Earl Bennett, a former teammate of Cutler’s, and tight end Greg Olsen to make up for the receiving depth. Olsen, mark my words, will be a Pro Bowler this year, as Cutler and he already seem to be in sync. Chicago is very set at running back with second-year player Matt Forte, who rushed for 1,238 yards and led the team with 63 receptions for 477 yards. The Bears don’t want to overwork him again and will use backup Kevin Jones more, plus Chicago no doubt will be throwing more this season as it is with Cutler under center. Believe it or not, it might be on defense where the questions lie with this team. Chicago was excellent against the run last year and should be again. But a lot of that depends on the health of star nose tackle Tommie Harris. He has been injury-prone and recently revealed he had knee surgery in the offseason. Harris has been very limited thus far in camp, too. Also of concern is the status of top cornerback Charles Tillman. He is expected to miss all of camp following back surgery. The Bears need him at full strength, as he covers all those No. 1 receivers. Chicago was torched against the pass last year, but in large part that was due to not getting enough pressure on the quarterback. Head coach Lovie Smith will make the defensive calls this season in hopes of remedying that, and the team expects a much better defensive line with the hiring of former Lions head coach Rod Marinelli. Bears predictions: Despite the health concerns of Harris and Tillman, the Bears say both should be fine to start the season. If that’s the case, I believe this is the team to beat in the NFC North and finishes 11-5. I am shocked oddsmakers only list Chicago’s over/under at 8 ½, but even if I’m being overly optimistic at 11 wins in my NFL predictions, there’s no way Chicago doesn’t at least match last season’s 9-7 record. This probably isn’t a Super Bowl team unless Hester turns into Brandon Marshall, but Chicago could reach the NFC Championship Game.